Do you need a weeknight go-to meal? 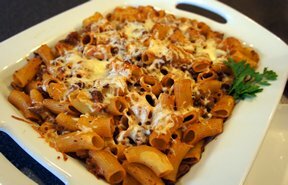 Here's a cheesy pasta dish that is sure to please everyone around the table. Use any pasta you prefer. Serve it beside a side salad and with some garlic bread to complete your meal. Preheat oven to 350 degrees. Spray a 9x13" pan with cooking spray. Brown ground beef, onion and green pepper in a large skillet. 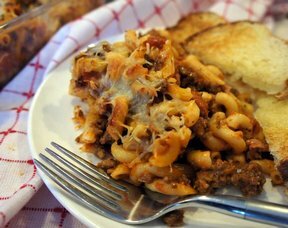 Mix ground beef mix, noodles, tomato sauce, 1 1/2 cups cheese and italian seasoning in large bowl. Place mixture in prepared pan. Cover with foil and bake for 35 minutes. 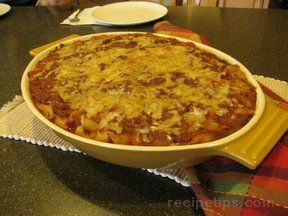 Remove foil and add remaining 1/2 cup of cheese on top. Bake 5-10 more minutes until cheese is melted. "OK. I uses rigotoni and thought they were too big. 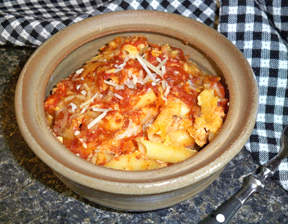 Next time I would use smaller noodles, maybe mini-penne, and double the sauce as I thought it was a little dry."